Avalon was actually quite entertaining. While I had trouble getting into it in the first half, the action started picking up towards the end and the ending was quite explosive. I'm typically not a fan of science fiction, and like to reserve my sci-fi enjoyments to visual media (television and movies) as I had mentioned in my brief review of Avalon's prequel novella Proxy. I'm not saying that reading Avalon has changed my mind or anything, because it's not really that outstanding of a book. Jethro Seagrave and his team of teenage intergalactic thieves work for a dangerous criminal syndicate leader named Hammer Dafoe. When the story in Avalon starts, the crew is in the middle of stealing a ship called the Montrose. It is the metadrive technology that Hammer wants--a navigation system or whatnot that allows ships to jump vast distances in space without using the Interstellar Transport Authority (ITA) regulated gates. It is during this heist that Jeth is confronted by an ITA agent named Renford who appeals to him to botch the next job Hammer gives him: Retrieve a lost ship in the Belgrave Quadrant. Instead of bringing Hammer the ship, Renford requests that Jeth bring the ship to him instead in exchange for his aid in reclaiming Jeth's family ship, Avalon, which is currently owned by Hammer. This is an irresistible offer considering Jeth's one life mission is to work as many jobs for Hammer as he can in order to take back Avalon. Of course, even as a teenager, Jeth knows that no one authority figure can be easily trusted, and so he decides to form his own plan to reclaim Avalon. And it all starts with this mission to retrieve the Donerail from the Belgrave Quadrant as well as the dangerous weapon aboard it that Hammer admits to coveting. But the Belgrave Quadrant is a dangerous place, a dead zone in space where ships and people have gone missing. Those who have survived travel through the Belgrave usually don't return without losing a bit of their own sanity. Avalon is a very typical space opera that doesn't seem too unique from other sci-fi plot lines I remember from television series. What works for Avalon is the cohesiveness of Jeth and his crew (although this was already done in Firefly, and I already mentioned that I wouldn't be able to keep myself from making the comparisons). And with so many similar parallels, it really IS hard NOT to keep referencing Firefly. Of course, as a YA novel following a group of teenage intergalactic thieves who are actually pretty decent at pulling off their heists, I've got to give credit where credit is due. Avalon set out to tell a story and tell a story it did. I'm not good at sci-fi jargon or terminology or the works. Some of the things going on in Avalon felt a bit far-fetched to me, but I let it slide because I'm not an expert on sci-fi and probably wouldn't know whether or not the world-building is legit enough to work. Now the storytelling, however, seemed a bit dragged on. The surprise twists weren't quite surprise twists when you kind of figured it all out in the beginning. How no one ever made the connection between Cora's tantrums and emotional ups and downs with the strange destructive holes appearing on-board the ship was a bit incredible. From the get-go you already have a feeling that there's more to Cora than just a random seven-year-old child that Sierra is trying to save from an abusive household. It's a pity that very little stands out about Avalon outside of its similarities to Firefly. 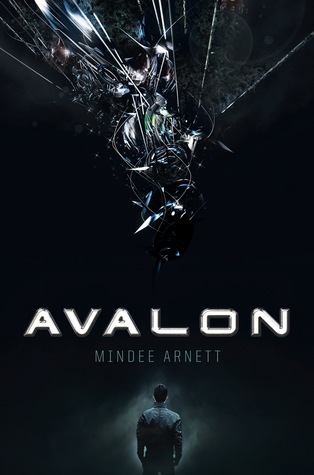 Avalon wasn't a bad book; on the contrary, had we had a bit more memorable moments or less flat characters, I might have found the book quite fascinating. As it is, the characters were a bit underdeveloped with fairly standard, clichéd personalities, and the story line was simple and straight forward with attempts at surprise twists that didn't... twist very well. I have nothing against any of the characters except for Sierra. While she is made out to be an independent, resourceful, strong girl who's one weakness is her lack of faith in humanity, I felt like she could have tried to stop and think about the bigger picture of things before acting. Because it had been her one un-thought-out decision that catapults all the chaos that ensues. And in the end, while she DOES feel apologetic and regret for what she did, I still feel like she got off too easily for it. I know she's not a bad person; but she made an entirely bad decision that could have been avoided had she just calmed down and stopped to think of the consequences. To be honest, Sierra is a nice girl, but I didn't really care for her much. Instead, I think I would have preferred Celeste for the love interest instead, but she wasn't as developed as a character as Sierra was. I'm a bit glad that the romance wasn't the biggest factor in this book when so much else was going on, though. Despite Jeth getting himself in trouble with romance for a milli-instant, at least he gets his priorities straightened out. The most likable character is Lizzie, but only by default because I always think it's cool when authors make a young girl the sci-fi/techie prodigy geek (and she's only thirteen). This is something that is more often reserved for guys (though I don't deny that in Real Life, all the techie geeks I know are all dudes). Overall Impression: Enjoyable, yet mediocre read with an abundance of potential. Great writing.